Do you want to learn more about FISH FLEET? Click here! Each boat represents 1200 tonnes of fish caught by different fishing vessels. The size of the vessels is represented on the right hand side with different shades of gray. 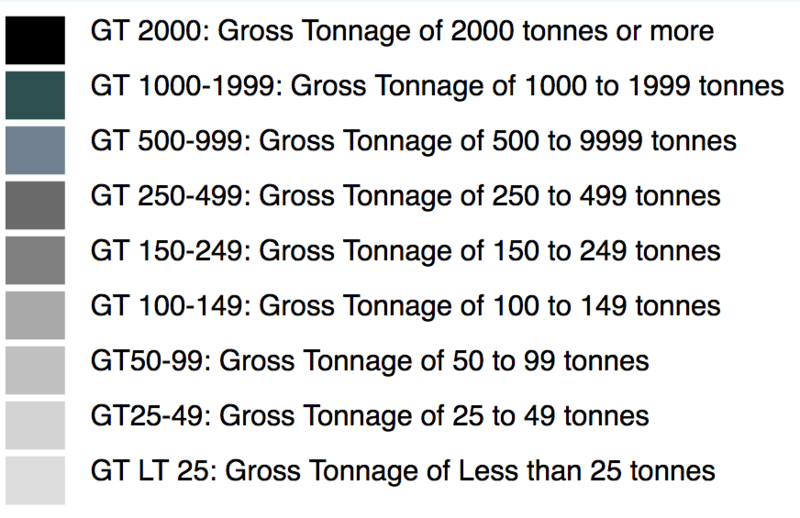 Fish tonnage caught by larger vessels are on top while smaller vessels are at the bottom. The country of the vessel is represented with different colors labeled on the left. The black ovals on top represent the year. The country and year labels, are buttons you can press to select the data you want to see displayed. The data was obtained from EUROSTAT European Fishery Statistics. It encompasses data from all EU countries beteween 2005 and 2015. This visualization was created at Manchester Metropolitan University, Centre for Policy Modeling by Luz K. Molina. This research was funded by the project SAF21 - Social science aspects of fisheries for the 21st Century. SAF21 is a project financed under the EU Horizon 2020 Marie Skłodowska-Curie (MSC) – ITN - ETN programme (project 642080).